At some point, super cop Bajirao Singham takes off his shirt and smacks it on the chief minister’s palm. That’s a Rohit Shettyism for resignation. That’s a Rohit Shettyism for, um, the force is strong with this one? 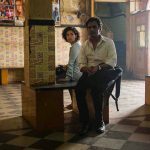 Even if unabashedly playing to the gallery and formulaic to its core, Singham Returns offers quite a bit to whistle about with its steady supply of straightforward action and a hot-headed hero who delivers a punch with a fist and a line. It doesn’t hold up to its potential in entirety, tumbling drastically in the middle to incorporate recognizable tropes and clichés. The final pay off is a bit tame for my liking but as long as it doles out generous scoops of unpretentious masala and corn, it works just fine. Only this time its titular hero Ajay Devgn doesn’t get to parade his bare, strapping torso like a glossy, egg-washed croissant to get our attention. On the contrary, his love interest (played by Kareena Kapoor Khan) pokes fun at his chestnut-dyed hair while his underlings quip about his growing umar. Considering the filmmaker got Shah Rukh Khan to play a 40-year-old in Chennai Express, Shetty seems well-equipped in the art of embrace-your-age within Bollywood’s ageing superstars. Regardless, Devgn’s power-packed slam bang is a lively reminder of his daredevil roots. Crafted along the lines of a 1990s no-holds-barred action, it’s a relief to watch the actor in a skin he’s most comfortable in. Except when bitten by the Satakhli bug, Devgn keeps it low key and reserves his stamina for moments of brute force, vigorous bang bang and swaggering in slow motion. Its fairly uncomplicated plot pits the self-styled cop Bajirao Singham against yet another agent of crime and corruption. Amol Gupte’s sleazy, swindling, wiry-haired god man and Zakir Hussain’s jumpy politician play the wily twosome whereas Anupam Kher and Mahesh Manjrekar represent the fair face of politics. As if to underline the distinction, the good guys are picture of composed grace whereas the baddies perform a cheesy romp of exaggerated notoriety. Despite these excesses, the first hour goes off like a breeze primarily because Shetty keeps the events relating to one another compact and gripping. Not too many cars (by Shetty standards) toss into mid-air but there are enough explosions, shoot-outs, vans/trucks clashing into one another. 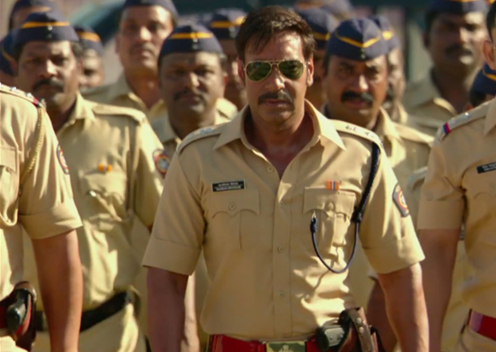 Though marginally better, Singham Returns is plagued by the same problem as the first one. It slows down in the middle to accommodate an obligatory romance with Kareena. For an actress whose presence comes through even when she’s a blurred out mute spectator in the background, this is hardly the film to be. Cast as Devgn’s loud, glutton girlfriend, Kareena, to her credit, keeps it spunky till the script makes her jarring (calling a North Eastern boy selling chowmein ‘Made in China’ is not even remotely amusing). Her director seems unsure about how to use her here. There are scenes where she’s simply not required — Singham’s work place or encounter sites — but it’s like Shetty has to justify her inclusion at any rate. What’s further grating is the raucous background score, alternating between clanking cymbals to loud Singham chants and the contrived usage of poorly rehearsed Marathi by its lead actors. 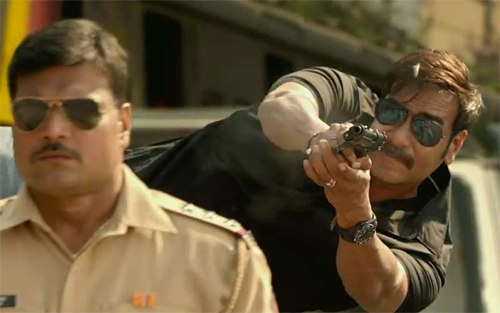 Ultimately, Shetty’s crowd pleaser antics boosted by Devgn’s blustering machismo and a hilarious hat-tip to CID make up for the earlier melodrama and a done-to-death twist concerning the all-important witness. Is that good enough? Wrong question. Is it entertaining enough? Er, yeah. 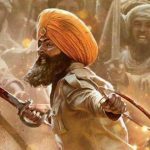 This entry was posted in Columns & Reviews and tagged action, ajay devgn, amol gupte, cid, cops, Kareena Kapoor, police, review, rohit shetty, singham returns. Bookmark the permalink.